toe, result from hyperextension of the big toe joint as the heel is lifted off the ground. 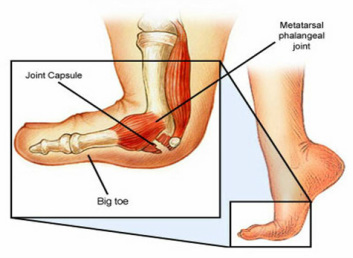 An external force is placed on the big toe, and the soft tissue structures that support the big toe on the top are torn or ruptured. Symptoms include pain, tenderness, and swelling of the toe joint. There is often a sudden acute onset of pain during a push-off phase of running. Usually, the pain is not enough to keep the athlete from physical activities or finishing a game. This causes further injury to the big toe and can dramatically increase the healing time required.